Imani Winds Julietta Curenton, flute Toyin Spellman-Diaz, oboe Mark Dover, clarinet Monica Ellis, bassoon Jeffrey Scott, horn Kenari Quartet Bob Eason, soprano saxophone Kyle Baldwin, alto saxophone Corey Dundee, tenor saxophone Steven Banks, baritone saxophone Fred Sherry, conductor Recorded live at Lincoln Performance Hall, Portland State University on July 3, 2018 as part of the Chamber Music Northwest Summer Festival. I. Apprehensive, yet bold – Più mosso, rushed II. Carefree, yet uneasy III. Stretched, restless IV. Wild, possessed V. Timeless VI. Revisitation of a wild and possessed state VII. Strained, unwinding VIII. Nervous, yet composed IX. 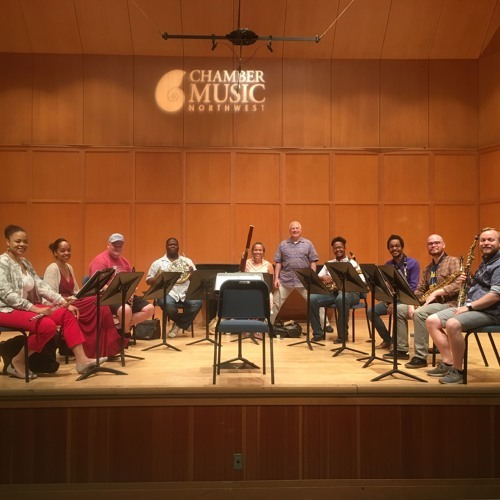 Frantic – With relentless energy 9x9: Nine Pieces for Nonet was commissioned by Chamber Music Northwest for Imani Winds and the Kenari Quartet. Faced with the challenge of writing for the quirky yet exciting combination of wind quintet and saxophone quartet, I decided to structure the piece in the form of nine short movements to mirror the number of instruments in the ensemble. The movements run attacca into one another, and each movement is thematically akin to at least one of the others. The piece is structured in an arch form, with the first four movements culminating in a more expansive fifth, and the last four movements mirroring the first four in reverse order.